Twang, crunch, bend, slide, swell, whomp, clamp. Meet the gorgeous sound of chrome-pressing-against-nickel: here, in all its sweaty glory, is the very first steel ever made for your iPhone and iPod Touch: Steel Guitar. We call it "Steel Guitar" advisedly: it's comprised of the four instruments that defined a good deal of Rock, Blues and Country. In it, you can select among the Lap Steel, Eight-String Console or either of the traditional Nashville or Texas setups. You can use it as a plain slide guitar (turn on the six-string "Lap" mode, and turn off the accelerometer), or use the full ten-string monster along with configurable "pedals" (actually, the axes of the accelerometer). Slide, pick, dip device to bend. Wire up the volume pedal and swell. Have fun. Slide along with Webb Pierce, Elmo' James or Allman Bro's...you pick the style, we provide the sound. 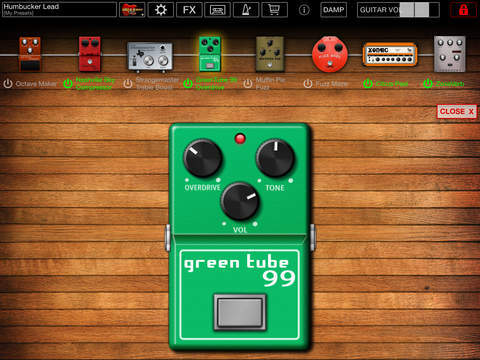 To boot, we opine that it's far easier to play than any other app-guitars out there. You be the judge. Here are a few tips. By default, we set it to launch on the Nashville setting, so don't be daunted seeing ten strings on the screen. Also by default, we kept the accelerometer active: so hold your phone flat to hear the tuning: dip it away from you, towards or to the left or right to activate various "pedals" to bend certain strings. You can go straight to the "Accel" menu under settings to eye the hook-up, modify it or turn it off. It's up to you. To play your first I-IV lick, hit strings 3-4-5 (numbered from the thinnest string) on open and give a quick flick to the phone to the right and facing towards you. Volume pedal is not active in the launch-default setting, to prevent confusion. If you cannot hear a sound in certain tunings or instruments, make sure that the phone isn't dipped to the left (with the pickup on your right), as that's where we wired all volume swells by default. Made prolly (and if so, proudly) in a smokey old N'Orleans sin-house. If you have any problems with installation or in-app purchase, found bugs, questions, comments about this application, you can visit the official website of Yonac Inc. at http://www.yonac.com/software/steelguitar/index.html.